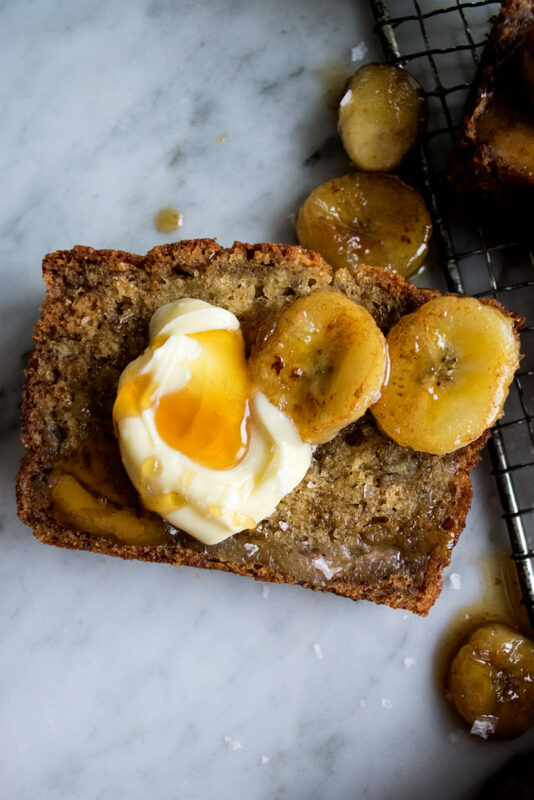 I am so excited to bring you this brown butter caramelized banana bread! I shared a few behind the scenes of testing it over on Instagram the other day and received an outpouring of messages asking for the recipe. Well, it’s here! So let’s get right to it. This recipe starts with your basic dry ingredients. I then combine both regular, granulated sugar and honey…along with some deliciously nutty brown butter. Basically, you’ll start by just melting the butter in a saucepan and then allowing it to cook even further until golden brown. You’ll want to watch this closely as it tends to burn quickly. 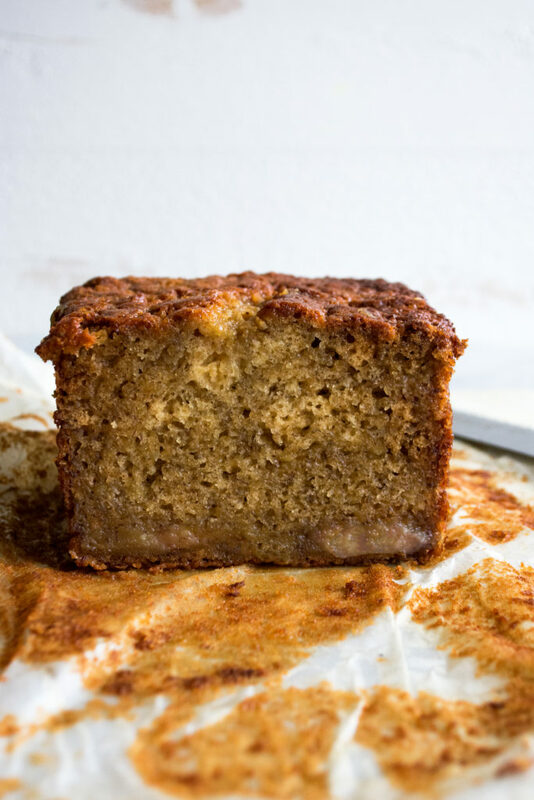 The brown butter completely enhances the banana bread’s flavor and adds that little extra something that I love. The bread also has mashed bananas (of course) and some tangy, creamy Greek yogurt. The yogurt adds a really nice richness that helps with the overall texture of the bread. And you definitely want to make sure to use extremely brown bananas for this. 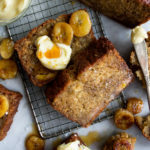 They should be extra dark and extra soft for the best tasting banana bread! For a bit more flavor, I’m using both vanilla and almond extract. I love using almond extract in my baking and I think it plays really well here. Once the batter comes together, it gets poured into a loaf pan. You’ll then quickly caramelize some additional bananas with butter and a little more honey. 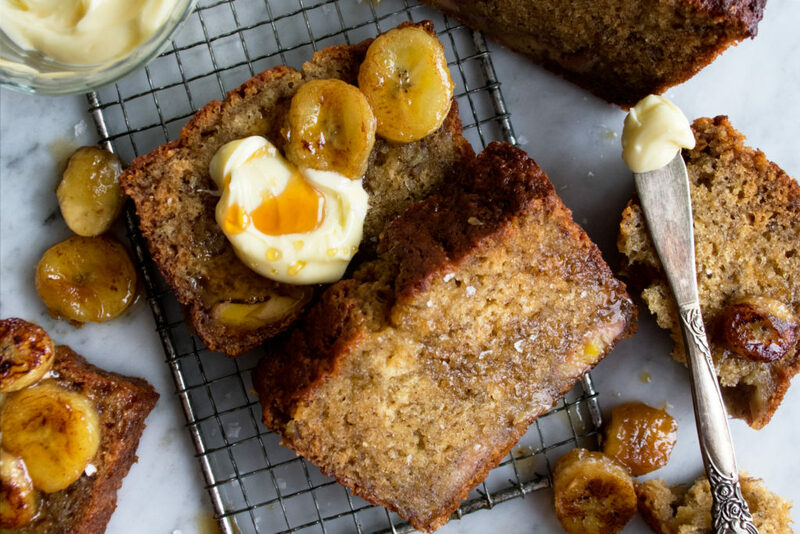 This is the secret to the best ever banana bread. Half of the mixture gets poured into the batter, creating an extra dense & moist interior. And then I like to save the rest of it to drizzle over the bread once it’s out of the oven. And the final touch? Softened salted butter to slather on top. 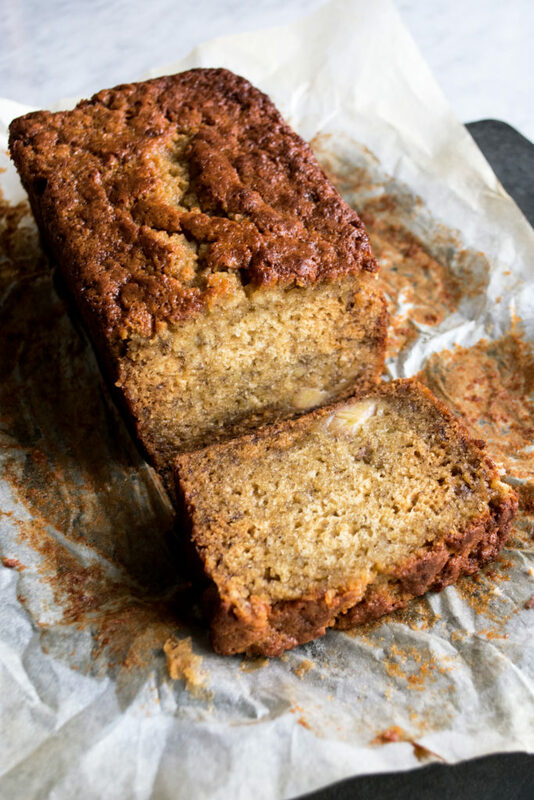 In my opinion, this is extra necessary and really drives home the wonderful buttery flavor of this banana bread. I hope you enjoy!! Preheat the oven to 325°F. Grease a 9×5 loaf pan and place a piece of parchment paper inside so that it sticks to the sides and hangs over the pan. Whisk the flour, baking soda, and salt together in a mixing bowl. Set aside. Add the butter to a saucepan and melt it over medium-low heat. Allow it to continue to cook over low heat as it starts to bubble. After 5-6 minutes, the bubbling will begin to subside as it becomes browned and nutty smelling. The speckles should be a deep amber color, but not black (watch it closely as it will burn quickly). Turn off the heat and allow the butter to cool slightly. Add the sugar to a large mixing bowl. Pour the brown butter in. Whisk vigorously until really well combined. Whisk in the honey, mashed bananas, eggs, Greek yogurt, vanilla, and almond extract until incorporated. Fold in the dry ingredients until smooth. Pour the batter into the prepared loaf pan. Meanwhile, heat a large sauté pan over medium heat. Add the butter and let melt. Add the sliced bananas, spreading them out into an even layer. Let caramelize on one side until golden. Season with a pinch of salt. Flip the bananas over and cook for another minute. Stir in the honey. Let bubble for a minute or so. Turn off the heat. Spoon half of the caramelized banana mixture over the batter. Reserve the rest for serving. Bake the banana bread uncovered for 55 minutes until browned. Let cool slightly. Use the parchment paper to pull the bread out of the pan. Slice it into thick slices and serve warm with softened salted butter, a drizzle or so of honey, and the reserved caramelized bananas. 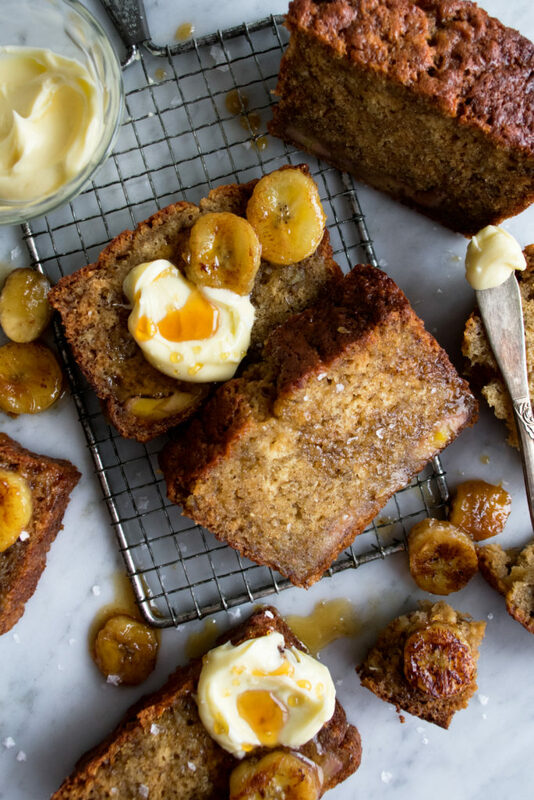 Use the darkest, softest bananas you can get your hands on for the best tasting banana bread! Ooooh that could be good! I personally really love the vanilla and almond flavors in this, though, and like to let the real bananas give the banana flavor. Let me know if you try it! Made this, but didn’t have enough honey or any greek yogurt. Mixed pure maple syrup with the honey and subbed 1/4 cup buttermilk for the 1/2 cup Greek yogurt. Soooo good! Thank you for an awesome easy to throw together recipe. Hi Betty! I’m so glad you liked this and I think your substitutions sound perfect. I’d love to try this with some maple syrup. Thanks for sharing!! I just made this and it’s honestly the best banana bread I’ve ever made! That is amazing to hear!! Thanks so much for sharing, and I’m glad you loved it.